North Pole, Inc. filed for bankruptcy today citing the economy and a shift in the marketplace from handmade goods to mass-produced products. News that Santa Claus, his family, the Elves and his Reindeer would have to find a new home came as a blow to children everywhere. For Santa the continuing economic crisis and a turn to goods manufactured overseas left him with little alternative: Downsize and diversify. Elves were laid off, and Santa’s wife, Mrs. Claus, was forced to take a second job. Eventually, Santa took out a second mortgage on the Pole. Hoping the economy would turn around, and that children would once again would ask for handcrafted toys instead of electronics and plastic toys, Santa patiently waited. But when the pre-Christmas season came and Santa sifted through the thousands of letters from children asking for products the Pole didn’t make, Santa knew his days at the North Pole were numbered. With a foreclosure looming, Santa knew what he had to do: File for bankruptcy. Broken, Santa and his family, were forced to abandon the Pole and relocate to the only place where they knew they could find the products American children were asking for: China. The story is fiction, but it may not be far from reality when you consider that American consumers may eventually inadvertently put poor Santa out of a business, if they haven’t already. 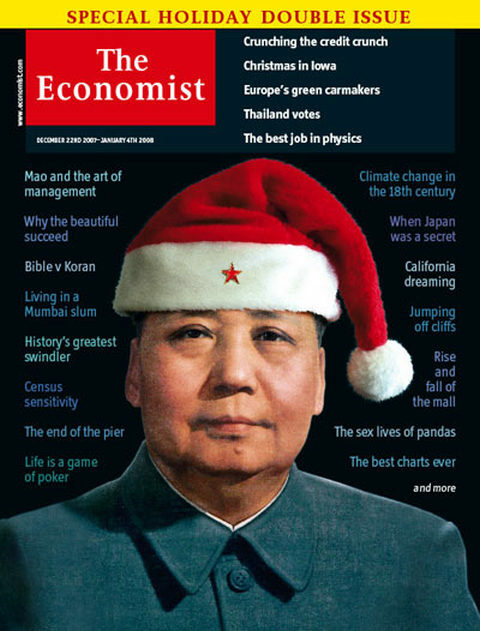 “American fellows, it is Christmas time, a time to wake up, have a strong cup of coffee, and see what gifts a Chinese Santa Claus really delivers. Each Christmas morning, when you open your sleepy eyes, the presents that light you up most probably bear a “Made in China” label. However, facing a declining economic growth, ballooning deficit and looming “fiscal cliff”, the Christmas season in the United States this year seems particularly chilly. 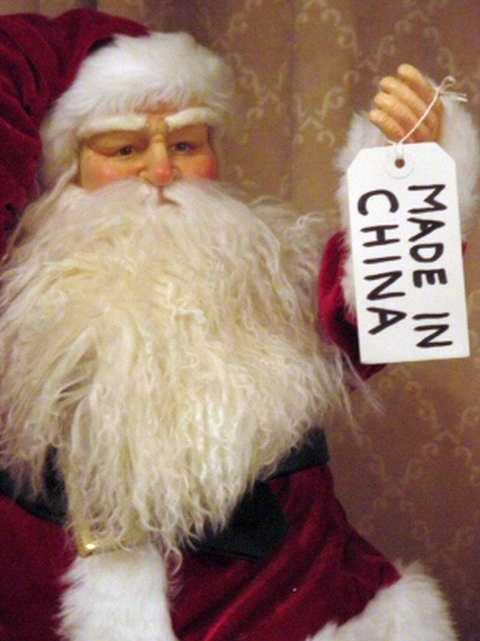 Amid the current economic chill, some major American media outlets recently called on the American people to boycott the “Made in China Christmas gift” and revive the “Made in America Christmas”. They spoke negatively about the quality of Chinese-made products and said “Made in China” has been controlling the American people and big businesses. The first high-level trade talks between China and the United States since both countries underwent leadership transitions just concluded last week. The world’s two largest economies and each other’s second-largest trading partners expressed their willingness to resolve trade disputes and enhance win-win cooperation during the high-level talks. It is time to let the truth do the talking. Our American fellows deserve to know the truth, the stinging truth about how the ubiquitous “Made in China” has helped the US economy. “‘Made in China’ not only won’t hurt our businesses, but bring them opportunities instead,” said John Duggan, an American attorney and long-time China watcher. “Made in China”, with its fine quality and low price, has greatly improved the purchasing power of the American people. This was especially evident after the global financial crisis. During the financial winter, the number of one dollar stores sprang up. Among those in these shops, “Made in China” products accounted for a large percent. Based on Morgan Stanley’s research report, in 2009 alone, approximately $100 billion in US consumer spending was saved by the “Chinese imports”. Capitalizing on China’s low costs of labor and raw material, American corporations managed to have their products manufactured in the large populated developing country, and sell them back to the tasteful US consumers with a handsome price. This huge “Chinese dividend” led a wealth of American companies to make investment in their manufacturing bases in China. As of today, China has attracted over 480 companies of the Fortune Global 500 to invest in this burgeoning economy. With China’s cooperation and participation, American corporations have found a sustained growth engine and witnessed increased share of wealth. While “Made in China” has greatly benefited both the average Americans and big US businesses, what frequently appeared in the American mainstream media were mainly the exaggerated quality issues of Chinese-made products. The bitter side of “Made in China” has remained unmentioned. From day one, it was the Western developed countries who got the credit, and China that did the dirty work. The majority of the “Made in China” goods are just original equipment manufacturer (OEM) products. China has merely served as an agent factory of the Western developed countries. According to a recent report by the People’s Daily newspaper, OEM products take up about 90 percent of China’s exported goods. At present, less than 3 percent of global brands accounts for about 50 percent of the total global sales, and 90 percent of these well-known brands belong to the developed countries and emerging industrialized countries and regions in Asia-Pacific region. “Made in China” has long been at the low end of the global value chain. The world famous Barbie dolls sold in more than 100 countries were mainly manufactured in China. For each Barbie sold in America for $9.9, there is merely $0.35 left to her Chinese “mother” for labor, plant & equipment and electricity. Moreover, those heavy industries, which are detrimental to the environment, were gradually moved to China. The developing country not only consumed its energy resources and damaged its environment, but was also demanded by some developed countries to bear the task of energy conservation and emission reduction beyond its carrying capacity. Behind China’s manufacturing bonanza, few noticed what a huge sacrifice the world’s second-largest economy has made, and how much pain it has taken to get this far. Behind the “Made in America” slogan, hardly any Americans questioned how much politics is involved. The Obama administration’s alleged plan to “revive American manufacturing” is simply a political advertising during the American election season, since America does not enjoy any advantages in low-end, labor-intensive manufacturing. The country’s real edges are in the high-end, knowledge-intensive sectors. In addition, with the rising trend of global economic integration, “Made in China”, to some extent, has evolved to “Made with China”. Many of the products labeled “Made in China” are not necessarily Chinese products, but American-brand merchandises. The economic globalization has made Chinese and US businesses better integrated. This Christmas morning, when you wake up and smell this couple of coffee, accept your gifts with gratitude. Anyone who is followed the unfolding tragedy of pets poisoned by treats ‘Made in China’ imported by U.S. manufacturers is hopefully beginning to realize that the problem is much broader and more complex than just toxic pet treats. The problem goes to the heart of American consumerism. Consumers so blinded by price, their myopic view of the world, unaware of the impact they have on it, they don’t realize the true cost of their reliance on the inexhaustible supply of inexpensive merchandise made in a country with shocking safety standards. Having gone to the Dollar Store to buy some last minute shopping, spending $14.59, I’m proud to say that nothing was from China, I think. The Milk Duds are from Hershey, PA, the Gummies from Chicago IL, the French palmier biscuits come from Argentina via Canada, the Campbell’s soup from N.J., the baking soda from VA, the Kleenex from WI. Not sure where the Fiddle Faddle came from. I read my labels, not that I can completely BELIEVE them. BUT, if I had some money, I would buy another DVD player to replace the cheap broken one, (they only last one year), and an iPod… and they won’t be made in Chicago IL or Hershey PA. It’s a double standard even if you are an avid label reader. Fortunately there are more “label readers” out there than last year or the year before. But let’s face it: alot of our stuff comes one way or another from China. Sad state of affairs for both countries, as Mollie pointed out.